Using prize-driven contests is a go-to tactic for many marketers. Why? Because the chance of winning a prize gives people the incentive to participate and engage with your content. Done right, a contest can be an incredibly cost-effective way to accelerate brand awareness, social engagement, and email list growth. Done wrong, it can be an epic failure that wastes time, money and effort. At Dot, our online marketing platform (dot.vu) empowers marketers to create engaging interactive content like contests – quickly and easily, without needing any special IT skills or coding. I’ve known clients who have run incredibly successful contests and others who missed the mark – simply due to lack of strategy, planning, and preparation. So I’ve learned a great deal about the do’s, don’ts over the years, which is why I’ve put together this easy-to-follow cheatsheet to guide you through the right steps in creating a successful online contest. Scroll down to read the detailed explanation of each step, as well as examples, template links, and other nifty tips. First things first, what exactly do you want to achieve with your contest? Without a solid definition of your goals, you won’t be able to execute, promote or measure your contest very well – so give this some serious thought! This is probably one of the main reasons why marketers invest in online contests. Getting people to opt-in for receiving e-newsletters, blog updates or other forms of promotional email content is getting harder by the day. Using a contest that requires participants to share their contact information in exchange for a chance to win is a tried-and-tested formula that works. Research shows that among the various conversion tactics used online today, contests have the highest average conversion rate of 35%. So email list/opt-in growth is definitely a good reason for which to run an online contest. Balance the length of your contest opt-in form with the value of participating in your contest. This refers to the value of your prize/giveaway + the content/educational/entertainment value of the contest experience. The longer your form, the less likelihood of people converting and opting-in. So pick the required contact input fields carefully. Balance the participant’s ‘time investment’ with the value of participating in your contest. How much time do you expect your audience to spend on your contest? Does is the required time justified by the value? Make sure to keep that in mind too! Debic is a professional dairy solutions brand owned by FrieslandCampina, a Dutch dairy cooperative with over 22,000 employees around the globe. They created this summer quiz contest to engage with 2 of their primary segments: chefs and bakers and generate new email opt-ins and leads. A contest is a great way to reach out to new people as well as existing followers in your community – making them more aware and connected with your brand. The key to successfully increasing brand awareness with a contest is a solid promotion strategy and a share-worthy, engaging contest experience. Since brand awareness is your goal, consider using one of your own products or services as the prize/giveaway. I’d recommend using a quiz contest that asks participants questions about your brand. Encouraging them to visit your website, watch your promotional videos or check out your product catalogs to answer questions – thereby getting them to actively learn about your brand. Encourage people to follow or like your brand once they are done with participating in your contest. Stay active after the contest is concluded! Follow up with other content pieces after your contest, to stay in touch and build relationships with all the new people you have just made aware of your brand. 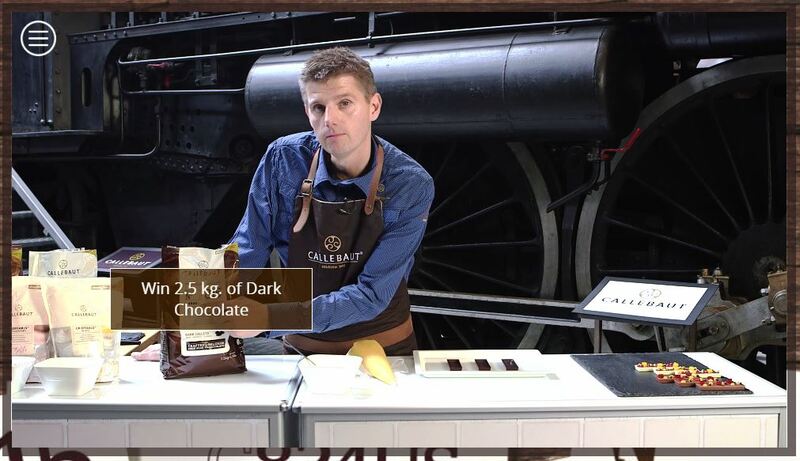 Callebaut is a premium Belgian chocolate brand, owned by the Barry Callebaut group that operates in over 30 countries with over 9000 employees. 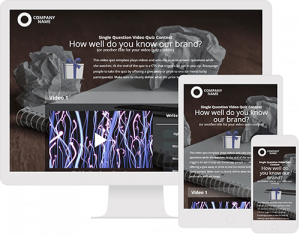 The brand used this interactive video tutorial that promotes active learning through a quiz contest about one of their featured products. Social media is a great vehicle for driving traffic to and participation in your contest. The key to boosting reach is getting people to actively do something on social media – liking, sharing or commenting on your post. Another popular tactic is getting people to make posts that include your custom hashtag. Make sure to comply with the latest rules and regulations of the social media platform you plan on using. For example, Facebook has a specific set of contest rules that keep changing ever so often. 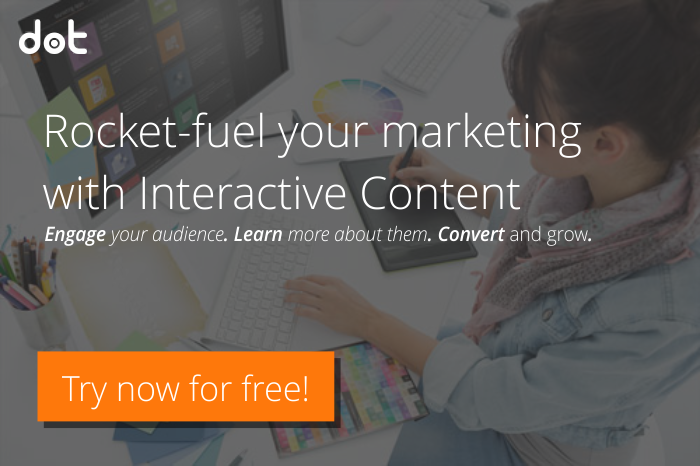 Create an experience that is engaging and share-worthy. Anyone can make a flat, boring contest ‘like-to-enter’ contest. The memorable ones, however, have an element of uniqueness, competition or entertainment to them. Get people to do something. For example, if you’re a fashion brand creating a personality quiz called ‘What is your style statement?’, encourage people to share their results (for example: “My style statement is Elegant and Timeless!”) in the comments field. 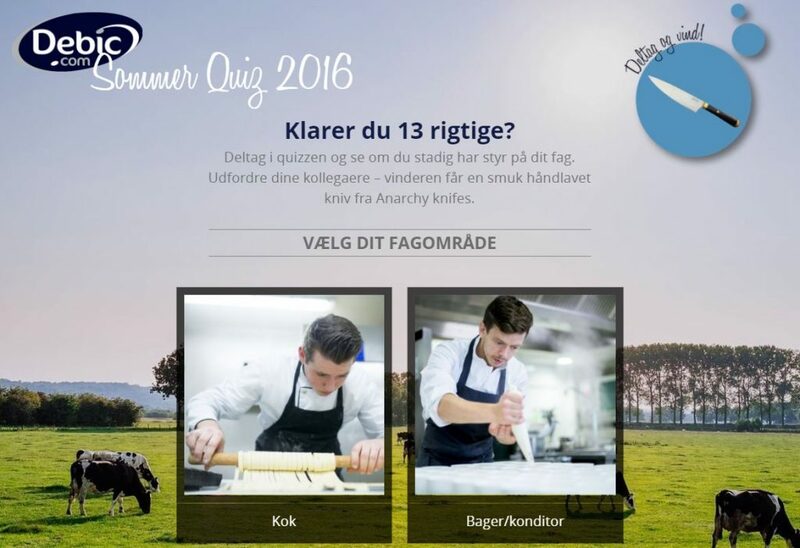 Example: Landbrug Og Fødevare (Danish Agriculture and Food Organization) used this quiz to educate the Danish population about the health benefits of adding more eggs to their diet. These kinds of quizzes are great at creating a buzz on social media. 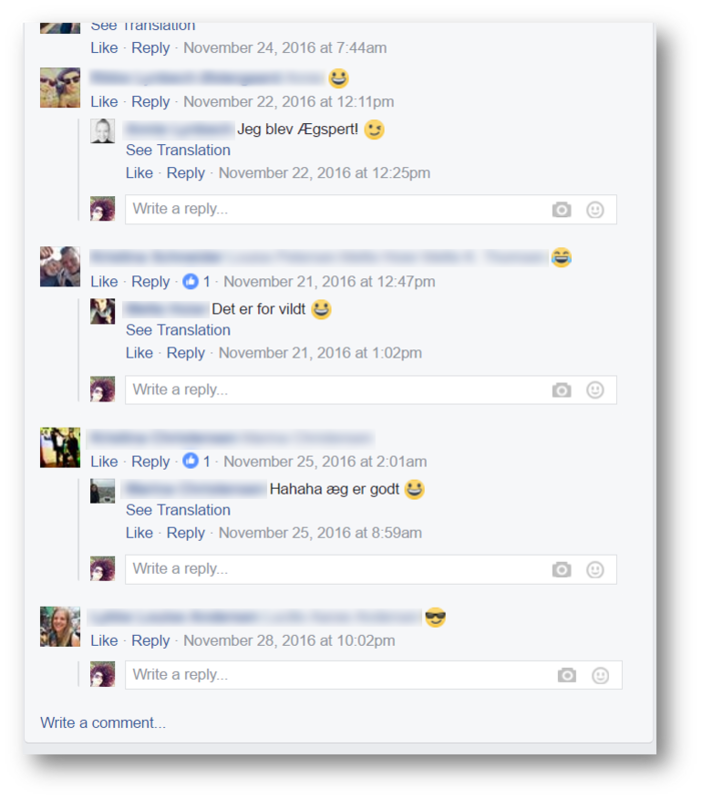 The comments above show how people wrote comments, tagged their friends and engaged with this contest on Facebook. Create demand for your products, services or offering by getting people to compete to win them. Whether you’re looking to promote a newly launched product, a limited-edition series or your own consultation services – a contest is a great way to do it. Make sure that the product, service or offering you’re promoting is the prize/giveaway. This will educate people about it, and generate demand as well. If you’re successful, your audience may even go ahead and purchase the promoted product, even if they don’t win the contest. Get people to dig into your website or webshop to answer questions about the product you are promoting. Put a spotlight on the USPs of the product, service or offering you are promoting – with links to your webshop or contact form. Benefit Cosmetics LLC is a manufacturer of cosmetics founded and headquartered in San Francisco, California selling at over 2,000 counters in more than 30 countries. They created this fun contest where the video stops and asks the user to guess what happens next. In doing so, they got the participant to watch a commercial and play to win one of their products. Click here to experience. Communication is a two-way street. By asking your audience for their opinion or feedback, you’re involving them and making them feel like their voice is important. In fact, research from Ipsos says that 52% of respondents say that using contests or asking for input about your current or new products will keep them connected and coming back to your site or social networking pages. More importantly, if you really are looking for audience feedback, adding the element of a gift/prize/giveaway in exchange for their honest opinion gives them more incentive to participate. Balance the participant’s ‘time investment’ with the prize value. How much time do you expect your audience to spend on answering questions? Does is the required time justified by the value? Don’t go overboard with your questions – for a survey/feedback type of contest I would recommend having between 1-3 questions, the maximum should not be more than 7-10 questions. Pick your questions carefully. These kinds of contests are not meant to replace a full-fledged survey, so keep your required data points to the minimum. If the feedback you require needs to be qualified. That is, if you need a certain type of person or profile to give you feedback, then make sure to promote the contest on the right channels, with the right demographic/geographic/job-title settings (if you’re promoting with social ads). A contest is a perfect opportunity to learn more about individual participants. Going beyond just contact details, you can strategically mine rich data about their needs, pains, preferences, habits, demographic profile and more by offering the incentive of a prize/giveaway. 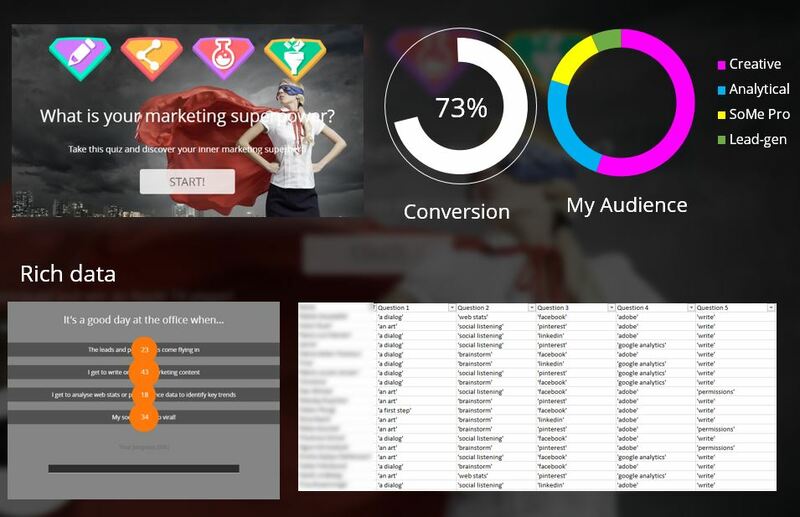 This kind of rich data is powerful in segmenting your audience and sending them targetted email campaigns and promotions – thereby increasing your conversion rate and avoiding unsubscribes. Read more about How to Automate Super-Targeted Emails. Define segmentation data points. If you’re looking to learn more about each individual in order to segment them into groups, make sure that the criteria you use are well-defined. For example, if you are in the business of selling furniture, you might want to use ‘home-type’ as a segmenting criterion. So a person who lives in a villa would get different content from one who lives in an apartment – making it much more relevant for the user. Don’t ask for too much! People are easily “creeped out” by too many invasive questions, so pick your questions carefully. 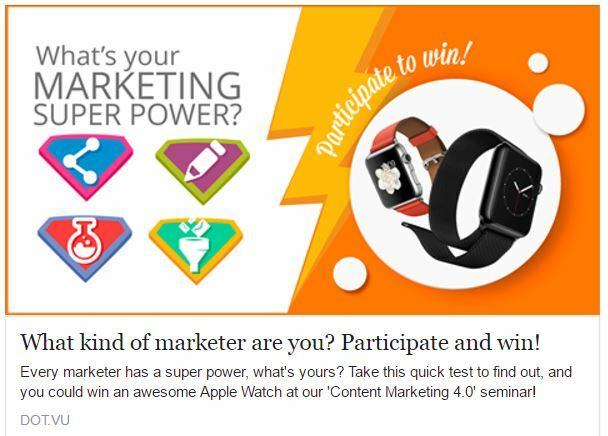 Example: Dot “What is your Marketing Superpower?” Quiz Contest. 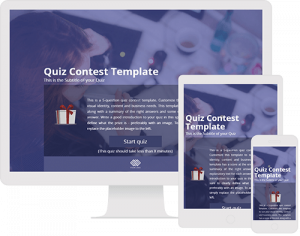 With this 7 question quiz contest, we achieved a whopping 73% conversion rate and captured vital data that helped us segment our audience, and learned so much more about them. There are loads of contest types that you can choose from, depending on your goals and objectives. Video Quiz Contest: Encourage your audience to watch a promotional video by inserting a quiz contest into it. In doing so, they will actively learn about your company, product or message. By adding the ‘contest element’ to your video, you can turn visitors/viewers into contacts for your email distribution lists. 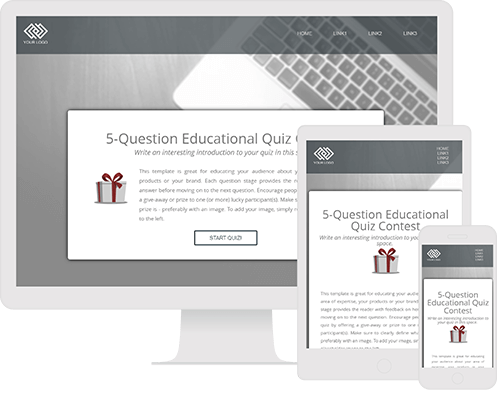 Encourage your audience to learn about your company, products or area of expertise with this quiz contest. Each question is followed by immediate feedback, thereby educating the participant about each topic or point. 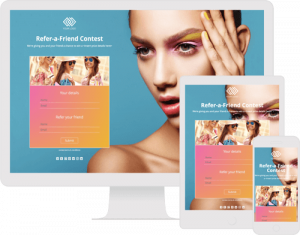 Expand your audience reach and grow your email list with a Refer-a-Friend Contest. Use this template to reward your followers for sharing the contest with their friends, who will then share it with their friends – creating a ripple-effect for our contest promotion. Encourage your audience to provide more information about themselves for additional chances to win your prize. Basic information like name and email will qualify them to enter, but providing extra information like phone number, address etc. will earn extra points and chances of winning. This needs to be appropriate with regards to what you’re asking for in return. So if you’re asking for people to spend 10 minutes answering a few questions, then your prize should be worth it. Would you pick just one winner or multiple winners? Perhaps you want to reward everyone who participates in the contest with a guaranteed prize? What does a person have to do for a chance to win? Take a quiz? Watch a video and answer a question? Give you feedback? Or perhaps just comment on your post? Make sure to be clear in communicating the qualifying criteria. A product of high demand, that’s relevant to your business and audience. For example, if you sell ingredients for chefs, you might consider using a beautiful chef’s knife set as your prize. Tickets to an event. For example, an FMCG company might choose to go for concert tickets, while a software company might pick passes to an upcoming industry trade expo. Courses in a specific field of expertise could also be an interesting option. This should be clearly stated in your contest terms and conditions. Geographical area: Does it matter where your contest participants reside? Age: Does the participants’ age determine their eligibility? Answering questions/additional factors: For example, does the participant need to answer some questions in order to qualify? Does he/she need to answer them correctly? “No purchase necessary”: State that the participant doesn’t need to purchase anything in order to qualify. Disqualification criteria: Are there any actions or situations where the participant would be disqualified from participating? For example, does being an employee of your company automatically disqualify the participant? Do typos in the email address disqualify? State the date the contest starts, and the day it is concluded. Number of prizes, the accurate description of each prize, the retail value of each prize and the odds of winning each type of prize. You might also want to mention that one cannot exchange the prize for another product, gift card or cash. Which factors influence the participant’s chances of winning? For example: if you’ve asked them to do write a suggestion for a new product, the quality of their input might be a judging criterion. When will you announce the contest winner? Where will you announce it? For example, you might announce the winner on your Facebook page, but also send the participant a winning notification email). What happens if the winner doesn’t respond to your notice? For example, the winner will be notified via email and has 7 days to respond. If they fail to do so, the company reserves the right to give the prize to another participant. For example, by participating in the contest, the participant agrees to share the required contact and other required information with the company. It’s also good practice to state that the participant’s information is safe with you and will not be sold to 3rd parties. If you plan on sending promotional email/SMS content to the participant, it’s good practice to state this in your contest terms. 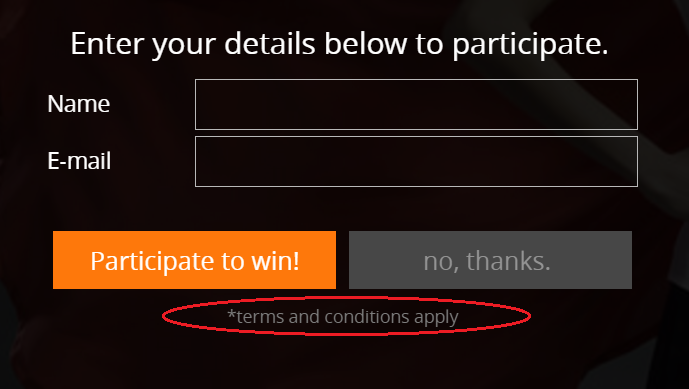 For example: By participating in this contest, you agree to receive promotional emails from <company name>. Place a banner or pop-up on your website or blog, with clear CTA’s, and a direct link to you contest landing page. Send an email to your existing subscribers. If you have a database of phone numbers, consider sending them an SMS campaign with a link to your contest landing page. Believe it or not, this actually works pretty well for mid-large sized companies. Make a small banner linking to your contest and add your colleagues to place it under their email signature for the duration of your contest. An example promo for a contest, as seen in a user’s newsfeed on Facebook. Notice how the title asks a question, enticing the user to click on it. Also, the prize is clearly mentioned with an image as well. This one’s a no-brainer. You should certainly promote your contest on your social media pages. You might also consider creating a custom hashtag and tell participants to make posts or comment on social media and include your custom hashtag. I would highly recommend doing this, as social media platforms like Facebook, for instance, have very low organic reach rates. So you might make a post on your page and it may not reach more than 2-5% of your followers. Consider setting a budget aside for paid promotion on social media. Reach out influencers in your industry, and encourage them to share your contest with their networks. If you have a set of popular bloggers or brand advocates on file, try and get them to help promote the contest as well. These kinds of tactics can be free, but may also require a small budget in order to offer an incentive to your influencers or brand advocates. If your product is sold through distributorships, you might want to try and get in touch with them to promote the contest through their channels. Once again, the cost of doing this depends on your relationships and agreements with the distributors. 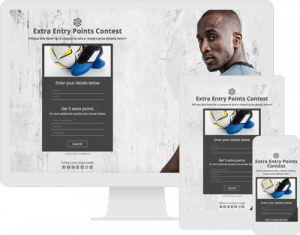 If your company has physical stores or spaces where potential contest participants go to, then you might consider placing some promotional material there as well with easy links to your contest landing pages. The same could apply to print media advertising. Although my personal experience has taught me that getting people to move from the physical world into the digital one is not so easy. Few people still use QR scanners, so tread with caution here. 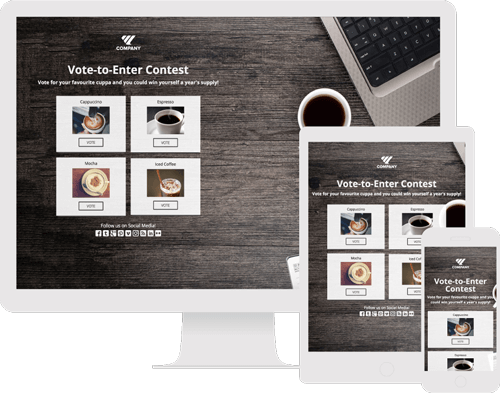 Once you’ve figured out what kind of contest you want to make (see step2) and chosen a template to customize (hopefully you’ve chosen one of ours listed in step 2), you’ll need to start customizing it with your content and visual brand identity. An attention-grabbing title: Keep it short, to-the-point and click-worthy. Questions work really well, for example: “Can you get 5 questions right? Test yourself and win a premium knife set”. The element of mystery works well too, for example: “Discover your perfect summer getaway and win it!” Mentioning the value of the prize is also a good idea “Enter our contest to win a handbag worth $300”. Contest introduction: Copy that sells and promotes the contest well. Contest opt-in form: Requires input fields for participants to fill in. Contest content: This depends on what kind of content you want to make. For example, if you’re making a quiz contest, you will need a set of questions and answer options. Other imagery and media: You might want to use other imagery, videos or gifs to support the look and feel of your contest. Thank you message: A message that says thank you to the user once he or she participates in your contest. Follow up email/SMS: Any follow-up content you might want to send the participants once he or she opts-in to the contest. This could be promotional content, helpful blog posts, links to e-books or something else. Create your contest landing page and publish it to your own custom domain, for example: yourwebsite.com/contest-name or contest.yourwebsite.com. You can also choose to place it (embed it) inside your website or blog. Figure our your promotion plan as per step4 and prepare all your promotional content. You might want to use a mix of promotional copy, imagery, banners, videos etc. Get it organized, prepared and launch your contest. The most successful contests are based on a culture of constant learning. What value did your contest create? Did it meet your objective(s)? Did it yield a good return-on-investment? Which aspects of your contest did you think were successful? Would you want to spend more time planning in advance? Use another prize? Increase or decrease prize value? Promote your contest in a different way? Follow up with participants immediate? The key is to learn from your successes and mistakes and make the next one even better! I wish you all loads of success in your next online contest and hope that this post helped you.